Inside the Beltway, politicians are fond of using roller coasters as an analogy for everything from the state of the economy to the fate of candidates' campaigns. Just outside the Beltway in Mitchellville, Maryland, Six Flags America offers some real roller coasters to help beleaguered citizens escape the Washington doublespeak. Food is not the park's strong point. It is bland, overpriced, and stripped of any local color. (Where are the crab cakes?) But if it's coasters you're after, Six Flags America has a tasty menu of thrills. And what great coasters! 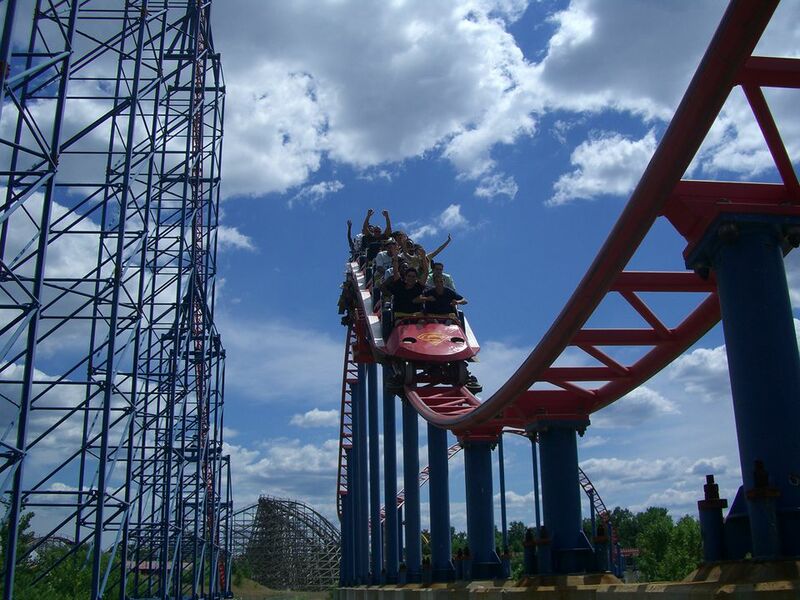 Superman: Ride of Steel is a new class of thrill called a hypercoaster that is 205 feet tall with a 200-foot drop. And it moves at 73 mph. You have to be tough to ride this one. It's 2.5 minutes of pure adrenaline rush. Curiously, the park's sleek, smooth flying coaster, which places riders in a superhero-like flying position, is called Batwing and is themed to Superman's non-flying buddy, Batman. Two of the Caped Crusader's archenemies have their own Six Flags America thrill machines. The Joker's Jinx is a magnetically launched coaster that accelerates riders from 0 to 60 mph in a straight shoot out of the station. Resembling a bowl of spaghetti, the demented track layout sends riders flip-flopping more than a congressman's policy position. After the wild launch, The Joker's Jinx feels muted as it meanders through its tangle of a track. Two-Face: The Flip Side takes the standard boomerang coaster concept and adds some interesting features. Instead of riding above the track, it uses ski lift-style inverted trains that leave riders' feet dangling. And the rows of seats face each other. Passengers navigate the course forward or backward depending on their seat orientation, then go in the opposite direction as the coaster retraces its route. All the while, riders can look into the eyes of the passengers seated directly across from them and either display nerves of steel or share a scream with reckless abandon. Bourbon Street Fireball: This is a giant, looping thriller of a ride was new to Six Flags America in 2015. Ragin' Cajun: This spinning Wild Mouse-style coaster was new to the park in 2014, but it is an older ride that was relocated from another Six Flags park. Bonzai Pipelines: Six water slides with 360-degree drops and launches chambers in Hurricane Harbor water park promise thrills that are especially welcome on a hot day. Apocalypse: This is a standup coaster recycled from the Six Flags park near Chicago, where it had been operating since 1990. Splashwater Falls: This interactive play area in Hurricane Harbor has more than 100 water features. Wonder Woman Lasso of Truth: This ride, new in 2017, takes you on the spin of your life on top of a 24-foot-tower going 40 mph. Bonus: great views of the Washington area.